 I love to ride bikes. 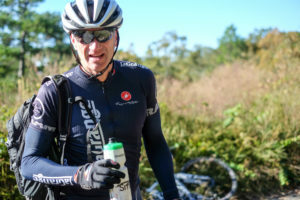 I used to participate in many other sports in my almost 50 years as an athlete (10 years as a Moots owner) but age, injury and time constraints, as well as the complication of juggling being a husband, father business person and athlete gave way to the simple pleasure of just riding a bike. So we are clear, for some reason I like to ride bikes most days and many of those days for a long time. This enables me to push myself of course, but even more impactful for me is that from a bike you get to know and experience the cities and places you live in and visit on a more intimate level, you meet incredible people you otherwise would never meet along the way and I continue to fulfill this endless need to be outside and living present. These traits are not unique to me, and for those of us that see the world in a similar way, you have inevitable began to dabble, or fully commit to riding gravel. Road and mountain bikes are fantastic don’t get me wrong, but the versatility and comfort of a gravel bike is, well perfect. Perfect for adventures to the road less traveled. Perfect for seeing things others don’t take the time to see or just drive by. Perfect for sharing these many things with others. Just Perfect. There is a reason that gravel is growing….roads like these sum it all up. As I reflect on 2017, all of my favorite rides turned out to be on my MOOTS Routt RSL on roads that not many see and with people that I won’t forget. 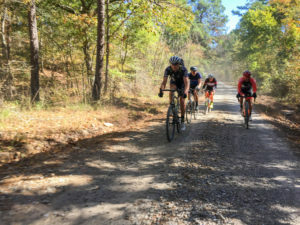 And the best ride of all, just happened a few weeks back in a place that up until now I didn’t think much about for cycling let alone gravel, Arkansas. 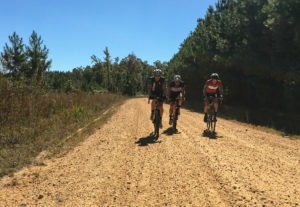 I was fortunate to get a call in mid October from my friend Brent, who just happens to own MOOTS, spinning images of a big, long and challenging ride with a lot of gravel, from Little Rock to Lake Ouachita, and back. Group TBD but promised to be cool and can hold their own. Route TBD but promised to be awesome and around 130 miles each way for 260 miles in 2 days on a Wednesday and Thursday (bonus miles!). Weather TBD but fingers crossed. Mechanicals TBD but we won’t have any right? With a quick confirmation from my wife that it was more than OK to be gone during the week, I booked a ticket from LA to Little Rock, packed up my MOOTS, and was off. 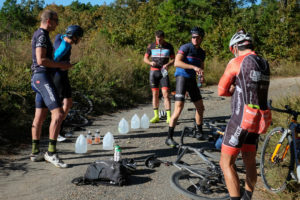 The group stops for a remote water stop. Travel went off without a hitch and I arrived Tuesday night. Right off the bat hospitality was already a home run. Brent picked me up from the airport and a with a little help from a F3 Velo he already had my Routt RSL ready to go, I was also fortunate to be staying at Brent’s home which made getting much needed sleep and last minute prep a snap. Good night and visions of how the 2 days helped me dream and get to sleep. Day 1 route was 130 miles with 7500 feet of climbing. 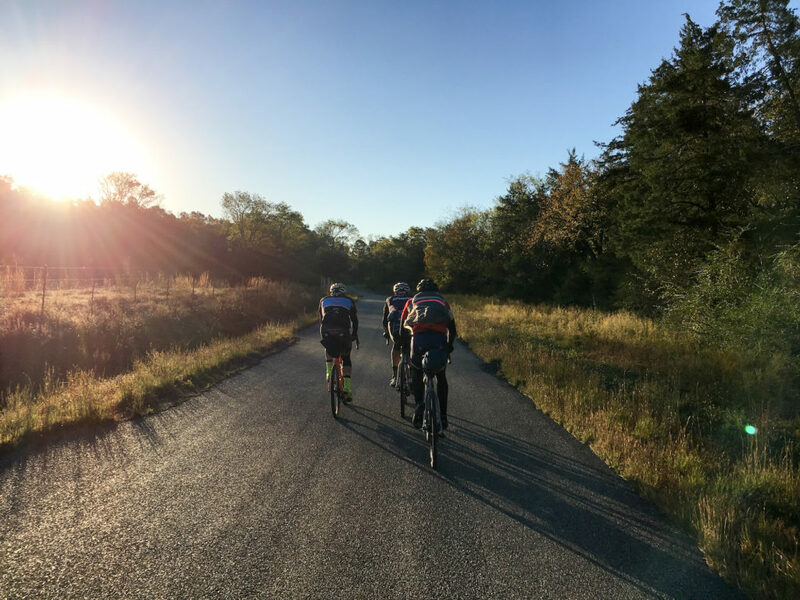 We would ride local roads and bike paths in the dark to start, for about 40 miles out of Little Rock until we hit 50 miles of consecutive dirt. Weather was looking good. 45 degrees to start and then low 70’s by mid day with little wind. Perfect. Brent and I left at 6:00am with a plan to meet Cole, Brandon and Robbin a few miles down the road and then pick up Chris. By mile 10 we have the entire crew together and start making our way out of town when we start to realize something. 45 degrees turned to 40 and then 35 and then 28! 28 is a lot different than 45 but after we took a quick break, the sun came out and as we got to the dirt, the temp normalized and all was good. Outside of one flat tire at mile 92, the group road the rolling gravel in the dense forest really well. No one fell, everyone was able to stay together and the terrain was fantastic. 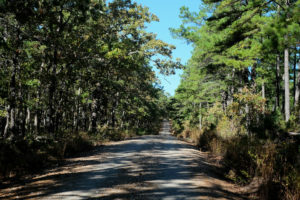 Mile after mile of dirt roads, gravel and jeep trails that were perfect for our bikes and perfect for a great day 1. We finished at Mt Harbor Resort with a shower, big food and great conversation. Could not have gone better and kudos to the group for all having the right attitude and approach to a huge 8 hour day. Day 2 route was 134 miles with 5500 feet of climbing. Different roads and 2 less riders as Brandon and Robbin actually had to go to work. This day was different than Day 1 as the gravel was surrounded by longer road sections. This was well received by all of us as each off road section was different from the other and our bikes handled it all with ease. The first section was really rocky and technical, section 2 was small pebble gravel and section 3 was relatively smooth and hard packed. All in all we saw the diversity of Arkansas both with the well paved farm roads (where everyone had at least 3 dogs, all friendly) and the diversity of gravel roads that we never would have anticipated. Similar to Day 1, no mechanicals, all riders stayed upright, we had incredible hospitality from the residents in the towns we traveled through and the overall again perfect. We finished up again with stories, ice cream and big food at a group meal at Brent’s home where we could all reflect on what we saw, what we learned and continue to develop friendships that will last much longer than the ride. My passion for bikes, MOOTS and people made this experience happen for me and I am a better person for it from every angle. Arkansas is a great place, I have 4 new friends and have a new appreciation for chicken on a stick. All enabled by a gravel bike and a desire to get outside. I hope your bike does the same thing for you!